So in preparation for tomorrow’s Bake Shop Blanket Square, you’ll need to know how to make a basic crochet heart. So what better time to make a quick video tutorial on crocheting these little symbols of love? But I can’t just show you how to make one kind of heart, now can I? 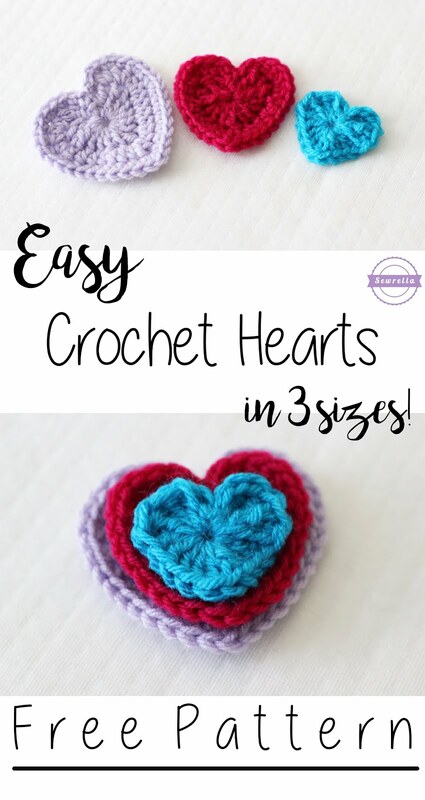 So I am showing you a simple way to make Easy Crochet Hearts – in 3 sizes! I have the written pattern below as well as the video tutorial – it is worth mentioning that you will need to make the LARGE SIZE for the Bake Shop Blanket Square that will be released tomorrow. I’ll be directing traffic (thisaway madam!) back here to whip up the heart you need to get started on that square tomorrow. And if you came here for a simple heart tutorial and you have no idea what I’m talking about – forgive the crazy lady writing this. We are trying to get her some help. Proceed below for the hearts! Sew these on blankets, amigurumi projects, hats, tie one on your key ring, or just fill a decanter with them and let the love be known! What will you use these cute little hearts for? Leave me a comment below! I am making chemo beanie hats for newborn to teens. I thought these hearts would look cute on the hats. So sweet, they will be perfect!